Neighboring 101: Moved by Compassion - Growing in Christ. Who is your neighbor? 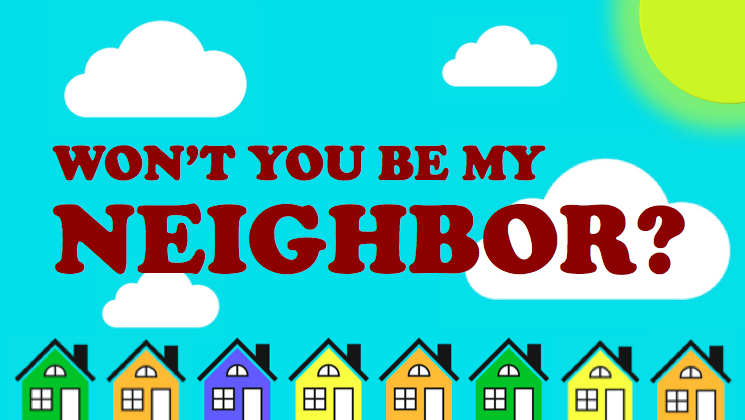 This is a great question as we start rolling in our newest message series Won’t You Be My Neighbor? We often think of a neighbor as someone who lives near us. But as we talked about in last week’s message, Neighboring 101 neighboring is more about what we do than were we live. Or we could say that “Neighboring is about action, not address.” Our neighbor can be anyone…or better said, we can be a neighbor to anyone. We have to decide if we want to neighbor. We defined neighboring by the acronym CARE. The story of the Good Samaritan in Luke 10:30-37 fleshes out this acronym CARE. Neighbors CARE as Compassion moves them to Action, then Relationship, and Empowerment. We’ll spend the next several weeks at Christ Church learning how we can CARE. As we dove into the Luke 10 and the conversation Jesus had that prompted the story of the Good Samaritan, we learned that neighboring was nonnegotiable for Jesus. You could love your neighbor without loving Jesus, but you can not love Jesus and not love your neighbor. It is a must! Why would Jesus place so much emphasis on Jesus-followers loving their neighbors? The answer is simple, because its what Jesus did. A Jesus-follower aims to do what Jesus did, and Jesus gave his life as an incredible act of love and grace for his neighbors…for us. I love how The Message paraphrases John 1:14 “The Word (Jesus) became flesh and blood and moved into the neighborhood.” Jesus decided to be a neighbor to us. How did Jesus CARE for us? As I shared, it began with compassion. Jesus’ love for us compels him into action. Thats what Compassion does, it compels or catapults us into action. As I promised on Sunday, below I share the full text from one of my favorite (fictional) stories of how compassion may have motivated Jesus. The heavy door creaked on its hinges as He pushed it open. With a few strides He crossed the silent shop and opened the wooden shutters to a square shaft of sunshine that pierced the darkness, painting a box of daylight on the dirt floor. He looked around the carpentry shop. He stood for a moment in the refuge of the little room that housed so many sweet memories. He balanced the hammer in His hand. He ran his fingers across the sharp teeth of the saw. He stroked the smoothly worn wood of the sawhorse. He had come to say good-bye. It was time for Him to leave. He had heard something that made Him know it was time to go. So He came one last time to smell the sawdust and lumber. Life was peaceful here. Life was so . . . safe. Here He had spent countless hours of contentment. On this dirt floor He had played as a toddler while His father worked. Here Joseph had taught Him how to grip a hammer. And on this workbench He had built His first chair. I wonder what He thought as He took one last look around the room. Perhaps He stood for a moment at the workbench looking at the tiny shadows cast by the chisel and shavings. Perhaps He listened as voices from the past filled the air. I wonder if He hesitated. I wonder if His heart was torn. I wonder if He rolled a nail between His thumb and fingers, anticipating the pain. It was in the carpentry shop that He must have given birth to His thoughts. Here concepts and convictions were woven together to form the fabric of His ministry. You can almost see the tools of His trade in His words as He spoke. You can see the trueness of a plumb line as He called for moral standards. You can hear the whistle of the plane as He pleads for religion to shave away unnecessary traditions. You can picture the snugness of a dovetail as He demands loyalty in relationships. You can imagine Him with a pencil and a ledger as He urges honesty. It was here that His human hands shaped the wood His divine hands had created. And it was here that His body matured while His Spirit waited for the right moment, the right day. And now that day had arrived. It must have been difficult to leave. After all, life as a carpenter hadn’t been bad. It wasn’t bad at all. Business was good. The future was bright and His work was enjoyable. In Nazareth He was known only as Jesus, the son of Joseph. You can be sure He was respected in the community. He was good with His hands. He had many friends. He was a favorite among the children. He could tell a good joke and had a habit of filling the air with contagious laughter. I wonder if He wanted to stay. “I could do a good job here in Nazareth. Settle down. Raise a family. Be a civic leader.” I wonder because I know He had already read the last chapter. He knew that the feet that step out of the safe shadow of the carpentry shop would not rest until they had been pierced and placed on a Roman cross. You see, He didn’t have to go. He had a choice. He could have stayed. He could have kept his mouth shut. He could have ignored the call or at least postponed it. And had He chosen to stay, who would’ve known? Who would have blamed Him? He could have come back as a man in another era when society was not so volatile, when religion wasn’t so stale, when people would listen better. He could have come back when crosses were out of style, but His heart wouldn’t let Him. If there was hesitation on His part of humanity, it was overcome by the compassion of His divinity. His divinity heard the voices. His divinity heard the hopeless cries of the poor, the bitter accusations of the abandoned, the dangling despair of those who are trying to save themselves. And His divinity saw the faces. Some wrinkled. Some weeping. Some hidden behind veils. Some obscured by fear. Some earnest with searching. Some blank with boredom. From the face of Adam to the face of the infant born somewhere in the world as you read these words, He saw them all. And you can be sure of one thing. Among the voices that found their way into that carpentry shop in Nazareth was your voice. Your silent prayers uttered on tear-stained pillows were heard before they were said. Your deepest questions about death and eternity were answered before they were asked. And your direst need, your need for a Savior, was met before you ever sinned. And not only did He hear you, He saw you. He saw your face aglow the hour you first knew Him. He saw your face in shame the hour you first fell. The same face that looked back at you from this mornings mirror, looked at Him. And it was enough to kill Him. He left because of you. He laid his security down with His hammer. He hung tranquility on the peg with His nail apron. He closed the window shutters on the sunshine of His youth and locked the door on the comfort and ease of anonymity. Since He could bear your sins more easily than He could bear the thought of your hopelessness, He chose to leave. It wasn’t easy. Leaving the carpentry shop never has been.